Interest rates set the cost of borrowing and lending for a currency. They have a big impact on a country’s economy. They are one of the strongest forces behind movements in foreign exchange markets. In most economies, the central bank responsible for monetary policy controls interest rates. Interest rates often move in cycles as the central bank uses them as a tool to increase or slow economic activity. Lower rates are used to kick-start a weak economy. They make it easier for businesses to borrow money to invest and grow. They also encourage people to spend rather than save. When a currency has a lower return against other currencies it will be less profitable to hold. This causes downward pressure because of a reduction in foreign demand. There will also be increased outflows as domestic investors try to get a better return elsewhere. A weaker currency makes a country’s goods cheaper to its trading partners. This makes them more competitive and increases export demand. The weaker currency will make imported items more expensive. This further boosts demand for domestic goods over imports, and improves the economy. There is now increasing upward pressure on the currency. Reduced imports mean there is less selling of the currency by businesses to pay for foreign goods. 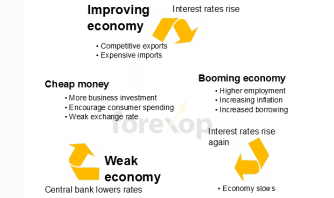 Secondly, increasing exports mean domestic firms will need to convert foreign currencies back into their own currency. Selling the foreign currency and buying their own. This adds to upward pressure. These conditions build a stronger economy. The improving business climate means fuller employment, less spare capacity and in turn rising wages. Higher wages feed through to production costs and eventually to prices consumers pay. This is inflation. As inflation increases, the central bank will have to raise interest rates to stabilize the economy. Higher rates make it more expensive for firms to borrow and grow, and will slow demand. It also causes the currency to appreciate. Export demand will slow, as the country’s foreign exports become relatively more expensive. The cycle then begins all over again.